A giant Airfix style kit of Ayrton Senna’s MP4/6 F1 car is set to go under the hammer at the Nurburgring on August 13th. 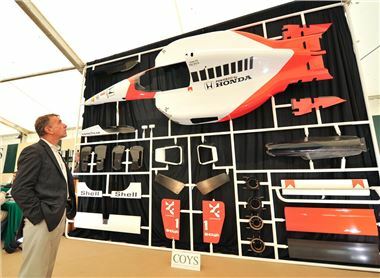 The gigantic model was revealed at the COYS Concours d’Elegance in July, which took place at Blenheim Palace by Senna’s former manager Dennis Rushden. Rushden said: : “I was really impressed with the Senna sculpture. Such a clever idea and it really stands out as something really different. Often at race meetings Senna would fly his radio controlled helicopter. He was really into models and he would have appreciated the concept. The model, designed by artist Jay Burridge, is expected to fetch between £30,000 and £50,000 when it’s auctioned later in the month, with the recent biopic “Senna” having piqued interest in the racer. These MP4/6 F1 car from Airfix was extremely superb and is looking so nice. The color and the design was awesome and so attractive. This was really very nice sharing and very well written information.